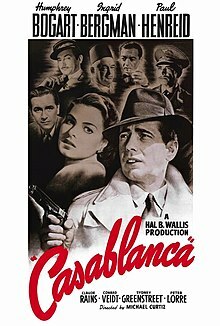 Casablanca is a 1942 American movie set in the Moroccan city of Casablanca during World War II. It stars Humphrey Bogart, Ingrid Bergman and Paul Henreid in lead roles. From the time of its debut, it has been called one of the greatest movies ever made. Critics have loved it for the romantic performances of Bogart and Bergman.